1.1 Frequency Separation and the Basics of Wow! Hello and welcome to this tutorial about Wow! Frequency Equalizer. Wow! is a Photoshop plugin built to enhance your photographs. It is a plug-in and not a panel, because it adds functions not available directly in Photoshop. Wow! is especially suited for portraits, but it can be successfully put to work with any kind of image. It’s easy to launch Wow! Just go to the Window menu, then Extensions, and then choose Wow! Frequency Equalizer somewhere down the menu, depending on how many extensions you have installed. As one shouldn’t try to drive without knowing at least the basic principles on which an engine is based, in this tutorial I would like to explain the core idea behind Wow! I will do that in a simplified way, without even using Wow! Wow! is based on a technique called frequency separation. This is something you can do natively in Photoshop, but Wow! brings it to a different level. What we have here is the portrait of a woman. As you may notice, there is a Group called Frequency Separation, currently not visible. Let’s make it visible and expand it: it contains two layers and an adjustment layer, and the image doesn’t look any different whether the group is on or off. If I isolate the background layer and use the Clone Stamp Tool on it, you all know what to expect. If I sample an eye and paste it on the forehead of the woman, the result doesn’t need any explanation. Let me now turn the background layer off. The Low frequency layer looks like a blurred version of the face, with no detail. The High frequency layer is a flat, grayish thing with basically no contrast… but it seems to have a lot of the detail. In this tutorial we’ll show the basic use of Wow! Frequency Equalizer. We’re going to work on the same image we used in the previous tutorial, where the principle of frequency separation was explained. The first recommendation is that you always work on a duplicate layer: Wow! changes the data in a layer destructively, so you may always want to keep the original image intact. So, duplicate a layer by dragging it at the bottom of the Layers panel onto the Create new layer icon. You may rename the layer if you wish, although Wow! will change its name anyway once you apply it. There are basically two ways you can go. The first: you start tweaking the sliders until you get a satisfactory result. The second: you start from one of the presets enclosed in Wow! The sliders correspond to five spatial frequency bands, as discussed in the previous tutorial. Left to right, the bands correspond to high frequencies which become progressively lower. If you prefer: detail is on the left, shape is on the right. The intermediate bands work on intermediate scales. Each slider can be either boosted or cut: a boost corresponds to an enhancement of a given band, a cut corresponds to a reduction. Sliders can be combined, of course, in whatever ratio. The effect may not be easily predictable at times, and it strongly depends on the image you are working on. Also, notice the sixth slider: you may think of it as the intensity of the overall effect, a bit like opacity: 100 is maximum (and the default) and 0 is minimum, corresponding to no effect. In general, when you choose a preset from the menu, the sliders will change their position and set themselves in a given configuration. You won’t see any effect on the image, though: to apply the configuration you need to click on the RUN button. The On/Off switch allows you to check the effect against the original image, and the Reset button resets the slider configuration and the image as well, without the need to click on RUN. You may prefer to have a live preview, without the need to click on RUN every time you change a preset or update a slider. That’s possibile: just click on the Preferences icon and make Live preview active. This is desirable, unless you have a sluggish computer: Wow! makes very difficult computations and it may take a while if you work on large images. In that case, my suggestion is that you leave Live preview off. You can switch from a preset to another without the need to reset anything: the new setting will overwrite the other. It is a good idea to use a preset as a starting point for your own elaboration: the names of the presets are rather clear in what they do. Let’s see them one by one. If you find something that you like, you may either change its intensity, in case it’s a bit too intense, or move the sliders around to change the nature of the effect. As for tweaking, remember: the leftmost slider controls detail, and looks a bit like sharpening when boosted, but it can cause small-scale smoothing when cut. The more you move towards the right, the more you apply something like hiraloam sharpening: enhancement or taming of shape rather than detail. So… just experiment, until you find what suits you. The combinations Wow! can generate are limited, but they are so varied that the scope of the plug-in is enormous. If you’re interested in advanced techniques, at this point, you may jump to the next tutorial. In this tutorial we’ll see how Wow! Frequency Equalizer can be used in different settings, suggesting also how apparently strange results can be exploited. The first picture we’re going to examine is that of a young girl in the woods. It would be a good idea to have a smoother skin in this picture. Duplicate layer, then let’s try to apply the Wow preset. There is undoubtedly a result, but not what I have in mind: I would like the color variation to be smoother, and also I don’t like the effect on the eyes very much. I then move to the Skin preset, whose name sounds promising, and the result I obtain is this. Apparently, it isn’t a very good result, because the overall look of the photograph is blurry. The eyes and hair, in particular, seem too soft. One would be easily tempted to trash this result, but I think a closer look at the skin may show something. Rather than looking at the skin, we should avoid to look at the rest, and evaluate the skin only. If we blind ourselves to whatever is not skin, the result is good. We therefore need to keep this version in the skin and the original elsewhere, which can be obtained by means of a layer mask. The easiest way to make a proper mask in this case is probably hidden in the Color Range command, available in the Selection menu. This command has an automated function which attempts to recognize skin tones in a picture, and there is some artificial intelligence which helps us to detect a face, so that another shape which may fall in that chromatic range is likely to be excluded by the selection. We only have on cursor named Fuzziness to refine the selection, and in general we want to have a white area in the skin, and black or anyway gray anywhere else. This seems like a good compromise, so we click OK and the command gives us an active selection. A click on the Add layer mask icon will create a layer mask which blends the two layers. Where the mask is white, the layer is visible; where the mask is black, the layer is transparent and the original shows through. Any gray area in the mask makes the layer more or less transparent, according to its density. As you can see, this mask gives us a smoother skin, but other parts are retained from the original. We may refine the mask by hand, or use one of the powerful functions available in Photoshop, but at this stage this will suffice. Just remember, in portraits, that there is an almost automatic way to select skin: it may work or not, but it’s worth a try. In this second example we’ll expand on the technique we just used, but we’ll also add an additional Wow! layer. The skin preset seems to work, with the same possible objection we saw in the previous example, but also the Wow preset yields good results. Let’s apply the Skin preset first, and then tame the results with a layer mask built exactly as before, by means of the Color range command. This is the original, this is what we have now… I am satisfied. I would like to apply the Wow preset to this version, so I’ll make a new composite layer (just use Merge visible from the Layers menu while keeping alt-option pressed), and then run the Wow preset onto this one. While I like the soft look of this picture, I would also love to have fine detail where needed, so I’ll just boost the high frequency slider. I am not afraid to enhance skin problems because they were taken care for by the Skin preset. There is a bit too much detail here in the eyelashes, but we already have a mask that works well in those areas. We just need to alt-option drag it onto the new layer, and this is the final result. This is the original… this is the Skin preset with the mask we created… and this is the Wow preset applied on the previous image, always through a layer mask. I think it’s a good result to obtain in less than one minute. In this third example we have a picture of a senior guy. A face like this has different demands than a model’s, so I would like to try something different and use Wow! more creatively than correctively. Let’s see what happens with the Enhanced black control preset. Some parts or the resulting picture are very interesting – the hair for example – and the skin takes up a painterly quality which turns the photograph into something like a cartoon: which I quite like, in this case. There are parts that do not work at all, though: the eyes almost disappear and the shadows are strongly enhanced. This could work in some cases, but it’s not at all what we want in others – like under the nose and around the eyebrows. This picture seems to need what we call a luminosity mask: that is, a layer mask that selects areas on the basis of their luminosity rather than geometry. There are several ways to do this in Photoshop, but they are rather complex and offer little control on the mask. 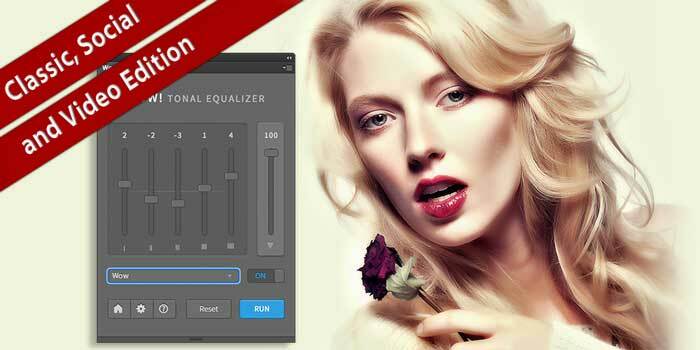 One possibility is to use our Mask equalizer plug-in, which can be purchased separately from Wow! This plug-in is totally independent from Wow!, but it really shines when they are used together. Its usage will be described in dedicated tutorials, but here’s a quick demonstration of its capabilities. First, I need to launch the plug-in from the usual menu. There are four main buttons located in the upper part of the user interface: Shadows, Midtones, Highlights and Shadows/Highlights. Normally, the mask is shown – but we’re not too interested in it now. We use the Comp button instead to inspect the result. With the Shadows preset, the darker parts of the picture are masked, showing the original on the layer below, and the lighter parts remain untouched. Midtones allows shadows and highlights to show through, but blocks – you guessed it – the midtones in the current layer, which therefore become visibile from the layer below. Highlights restricts the action of the mask to whatever is not too light, and Shadows/Highlights is basically the opposite of Midtones. We want to massage the shadows a bit, so either Shadows or Shadows(Highlights is a good choice. I personally prefer the latter, because it keeps the light spots on the skin from becoming too bright, but it’s really a matter of taste. At this point, you can manipulate the mask in several ways if you need it, but I’ll leave it alone. Further uses and characteristics of this plug-in will be discussed in the dedicated tutorials. Here it is: this is, for now, the end of the Wow! tutorials. We’ve seen three examples using techniques a bit more advanced than simply applying a preset and I hope you enjoyed them. Follow me in other tutorials if you wish! Hello and welcome to this tutorial on Wow! Frequency Equalizer PRO, that is the extended version of Wow! Frequency Equalizer, a plug-in whose operation is based on frequency separation. We’ve discussed the principle of frequency separation and the basic operations of the original plug-in in different tutorials, so we won’t get into those details again. We’ve paired the two editions side by side, so you may see the differences. Both can be launched, of course, from the usual Window menu under the voice Extensions. On the left, you see the classic version of Wow! Frequency Equalizer, on the right, the Pro version. You may notice that the only difference in the interface is represented by an additional row of controls, namely a checkbox called Luma, a couple of buttons named Classic and Social, and a button called Decompose. I will now close the classic version of Wow!, because everything we need to access is available also in the PRO version, as we just showed. I would like to start from the center, to show the difference between the Classic and Social modes. In one of the previous tutorials, we’ve shown that the behavior of Wow! is quite different depending on the size in pixel of the image we are working on. This can actually become a problem when the images are very small: you may object that usually you don’t deal with files whose linear size is just a few hundred pixels, but sometimes you might – and I am referring of course to the images headed to social networks, like Facebook or other well-known platforms. If you try to apply a Wow! preset to an image whose main scope is to become an avatar on Facebook, you may encounter problems. Let’s see why. The two images you’re seeing look identical, but they’re not. The one on the left is a lot larger, with a height of 3000 px. The one on the right was scaled down by 25%, yielding a height of 750 px. The reason why they look the same size is that the zoom factor in Photoshop is different for each of them. Yet Wow! doesn’t know about zoom factors: it only can work on real pixels. Let’s see what happens when we apply a certain preset, like Wow!, to the large image… and the same preset to the small image. You can certainly notice how different the two results are. The large image shows what we expect from this preset, whereas the small one looks like it’s been badly sharpened: there’s no added smoothness, and I would have a hard time defending that this is a Wow effect. That’s why the Social alternative has been added. If you enable this button, a different algorithm is used in the computation. 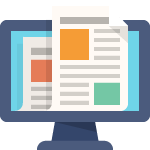 The algorithm is optimized for small images, and in turn, it won’t usually work on larger ones. It would be unrealistic to expect that an equally-named preset yields the same results, because these still depend heavily on the size of the image. But, as you may see, the resulting image is a lot more acceptable, as a starting point, than we would obtain with the Classic setup. So, the recommendation is that you enable Social rather than Classic when you’re going to work on a set of images already resized for the Web. At this point, we can close the smaller image because the new features we’re going to discuss are not size-related, so we’d better work on a regular image. Let me reset everything: trash the newly created layer, duplicate the background, and here we go. A close inspection of this photograph shows that the skin needs some retouching. There are dozens of techniques, more or less sophisticated, to do that, and one of these relies on a decomposition of the image in two frequency layers. As we know, Wow! works on five different frequencies, which are controlled by the sliders. We go back to Classic mode, of course, and we apply a preset. It could be Skin… or Wow… I think Wow is a better starting point, in this case, if we’re going to retouch the final result. Let me draw your attention on the Luma checkbox, first. If you make it active, there’s a difference in how the color of the image is treated. Wow! can sometime cause small color shifts, especially in saturation, which may be visible, or not. If they are, they may be pleasant, or not. If they aren’t, you can click on this button and instruct the plug-in not to re-compute color: in practice, when Luma is active, the original color remains untouched. As I said, this may be an issue or not, but it’s worth having the chance to change the default behavior of the plug-in. Finally, the Decompose button: a really unique feature. Wow works on five different frequency layers, but where are they? Well, they’re hidden: you actually manipulate them with the sliders, but there’s nothing else you can do. Unless you use the Decompose button: let’s see what happens. This operation may take a while, especially on a slow machine, but in practice you get a decomposition in six different layers: what scientists call a “pyramid” of layers. Each one of these addresses a different frequency. Bottom to top: a base layer image, extremely blurred, followed by decreasing frequency layers. The smaller the frequency, the finer the detail. These are real layers, that you can manipulate at will. The layer named Scale 2 seems to be responsible for most of the skin blemishes, so using the Clone Stamp tool on it sounds like a brilliant idea. This doesn’t change the remaining frequencies, I remind you, so that every layer addresses a single and peculiar characteristic of the image. I’ll show you very quickly what you can do, making sure that the Clone Stamp tool is set to sample the current layer only, Normal mode, 100% opacity. One interesting technique is that you can obtain exceptionally smooth results even on large areas, by blurring the right frequency layer. If you look, there’s a darker area here which we may want to make smoother. By inspecting the layers, we realize it’s very visible on the one called Scale 4, less on Scale 5, not at all in the others. So, we decide to blur Scale 4 locally. With the Lasso tool, with a generous amount of feathering applied, you can select the area you need to blur, then make sure the correct layer is active, and blur with a filter like Gaussian Blur, or any other blurring algorithm you may want to try. The radius is usually quite a few pixels… something around 40 will do, in this case. See? This is before, this is after. This may be repeated on other areas if needed. Una breve presentazione della gamma Wow! Permette di modificare i valori tonali di un’immagine ottenendo immagini di rara potenza espressiva. Esclusiva di Wow! è la possibilità di mixare con risultati sorprendenti i valori positivi che creano nitidezza o contrasto locale e quelli negativi che creano morbidezza e splendide gradazioni tonali. Aggiungendo nitidezza in alcuni canali e togliendola in altri, opzione esclusiva di Wow!, otterrai un’effetto sorprendente con gradazioni tonali incredibilmente morbide. Prova i nostri preset “one click” e se necessario migliora il risultato regolando i cinque cursori grazie alla all’anteprima immediata di alta qualità. Ora disponibile come Classic, Social e Video Edition. Un Wow! in miniatura. Un algoritmo ridisegnato, con cursori più corti e preset coordinati. Aggiunge un look sorprendente a file da 800 a 1500 px. Funziona fino ad un massimo di 1920x1920px. Il nostro rinomato Plugin per la separazione di frequenze. Per uso universale e professionale. I preset sono ottimizzati per file di medie o grandi dimensioni. Permette di lavorare con applicazione manuale o live preview, ad anteprima istantanea. Lavora con lo stesso potente motore di Wow! Classic. Stessa facilità d’uso e resa tonale. Anteprima incredibilmente veloce e tempi di esportazione brevi.